Get some cute vinyl at Say It On the Wall. 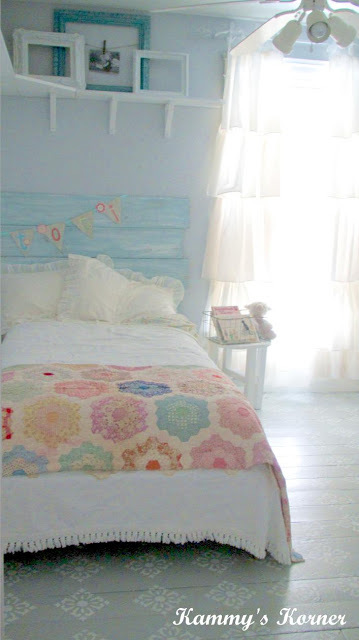 This pretty shabby chic bedroom was a hit last week at Kammy's Korner! Adorable! Did you see the Valentine's Linky last Friday! There are lots of projects out there. You can add yours too the group. Thanks for the party. Not sure if you've just recently installed a new gadget BUT I kept getting a "Caution Malware" message before I could enter your site-- so if your stats are low today that may be the issue. I trust your site so I just by-passed it and wanted to let you know. Thanks for hosting! Have a Happy Valentine's Day! Hope you have a great week! Hi Michelle, Thank you for hosting again! Thank you so much for hosting Michelle!! I also got a malware warning because of a button from Today's Creative Blog. It says that blog has problems. I enjoy reading your blog and hope this gets worked out. Thanks for a great party, Michelle. I posted a valentine round up today, and I'm going to go back and add in your monster eye Valentine. Love it!!! I'm at OneCreativeMommy.com, if you want to check it out. Oops--just realized the idea came from Julep. I'll let her know I featured it. Thanks! Thanks for the party, Michelle! Happy Valentine's Day! Thank you so much for hosting! I pinned lots of wonderful ideas! Thanks for hosting - great party! I brought over Red Hot Chocolate Chippers, Old Fashioned Sugar Cookies, and a Valentine's Wreath. We are having a party atTumbleweed Contessa too - What'd You Do This Weekend? I'd love it if you would bring something by a look around.